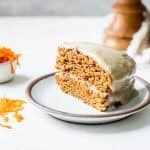 This Whole Wheat Vegan Carrot Cake is moist and flavorful, plus made with some healthier substitutions like flax seed, whole wheat white flour, applesauce and coconut oil for one amazing cake everyone (yes, even the non-vegans!) goes crazy for. 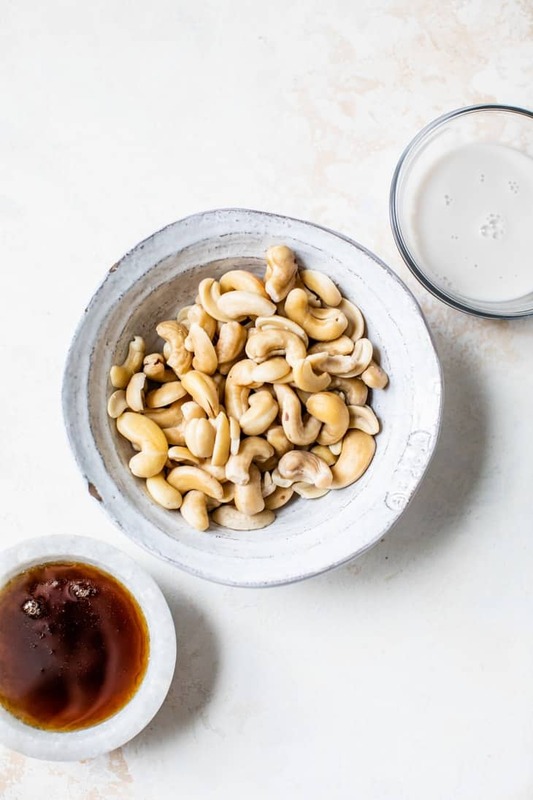 *photos and recipe slightly updated March 2019 – same deliciousness! 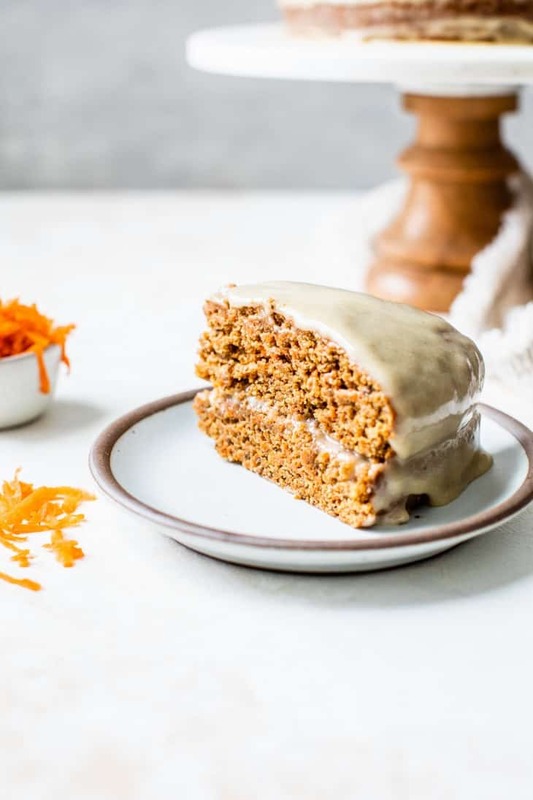 So I made you a vegan carrot cake with cashew frosting… and it’s kind of amazing. And I’m not just saying that – everyone that tries this cake *loves* it. And pretty certain they have no idea it’s made egg free and with whole grain flour. The first time I made this vegan carrot cake I was testing it on some coworkers. It didn’t last long. The next time I made it for my family for Mother’s Day (carrot cake is my mom’s favorite). My family doesn’t really want traditional baked goods to be messed with but I do it anyways 😀 And guess what? Winner winner carrot cake for dinner. To start the cake, make up your flax eggs first. You’ll need to let your flax seeds soak in water for about 10-15 minutes, until a thick gel forms. This acts as the egg replacer. Meanwhile mix together the dry ingredients (separately) and grate your carrots. 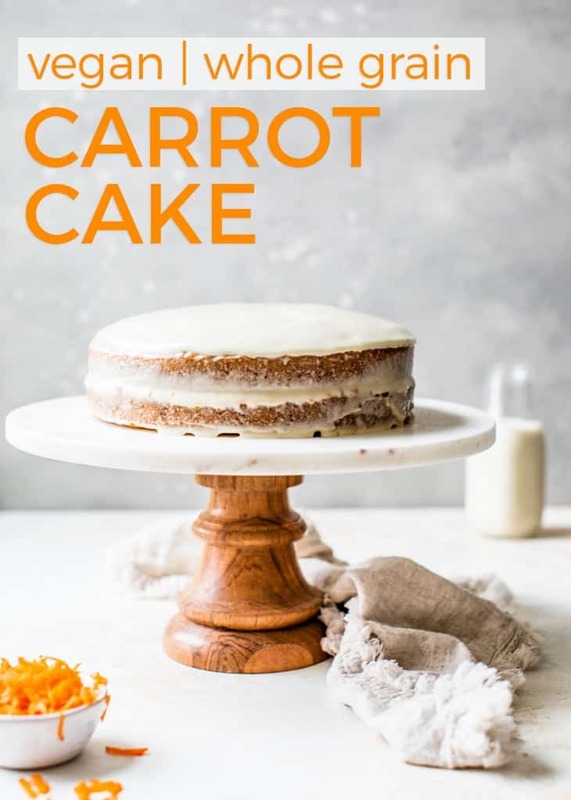 If you’re not grating the carrots by hand, this cake can be made even quicker by using a food processor. I used my food processor* with the shredding attachment, then the blade to cut them down into bits. You then transfer the carrots to your bowl of flour, baking soda, baking powder, and spices. And because I didn’t want to dirty another bowl, I just wiped out the food processor bowl and started combining the wet ingredients in there. 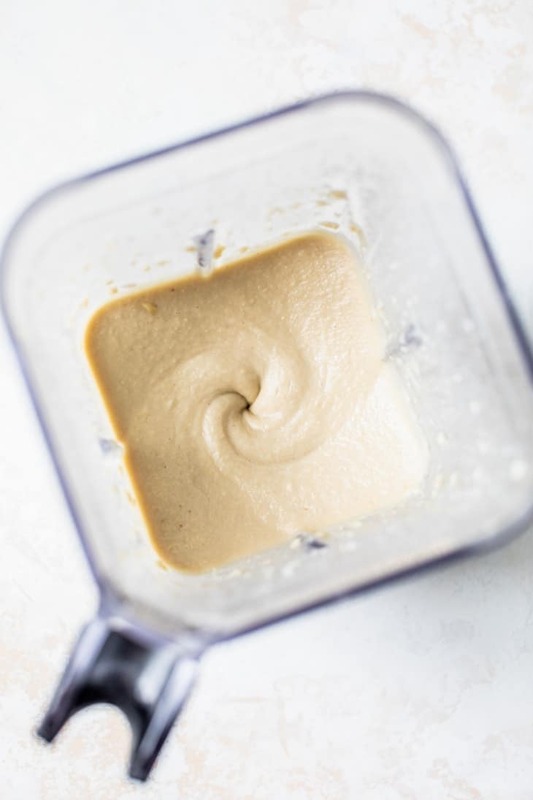 Blend the sugars with the flax eggs, then add in your melted coconut oil and applesauce. Once that is all blended, you add your wet ingredients to your flour/carrot bowl of dry ingredients and gently combine. Then evenly disperse the batter into two lined 9″ round cake pans. I used both parchment paper + greased the pans with coconut oil to ensure they came out perfectly. This cake should take roughly 25 minutes if using 9″ round pans. Just let cool in the pan for about 20 minutes before transferring to cooling rack. If you are using a 9×13, watch cake at 35-40 minutes, and test with toothpick until it comes out clean. I did not test in a 9×13 pan myself, so if you try it out let me know how it goes! This frosting isn’t like your standard buttercream. It’s a little thinner. But you can you full-fat coconut milk to create a thicker consistency. And also make sure you chill the frosting before whipping. Then frost the cake. So I hope you guys make this cake!! Vegans and non-vegans alike will love it. 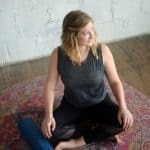 Let me know if you try it by leaving a comment and review here on the blog. Omg I am over here drooling I want this so bad. 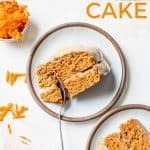 Carrot cake has always been my favorite type of cake and I know I would love your vegan version!! Lol you would totally love this then! GIRL same brain I just ate carrot cake over the weekend (a really unhealthy cake mind you…. ) and I was thinking of attempting a slightly healthier version as my next cake adventure. But now I’m not so sure because this looks and sounds PERFECT. I love that you used cashew frosting, too. I love classic frosting (duh), but I also love pretty much anything cashew-based. And I totally agree with you about cashews. They are so good and I’ve been loving finding different ways to use them in recipes. This cake is stunning! 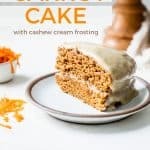 Carrot Cake is the BEST kind of cake hands down, love that you made vegan version! Love that you love carrot cake so much! It is actually not my favorite, but I love the spices and texture of it 🙂 Thanks Rachel! Complete perfection! I’m secretly a rabbit so this is speaking to my soul…;) Thanks for sharing Ashley!! Hi there! You can honestly use either! Just use 1.5 cups total of sugar. I just happened to split it into half granulated white sugar and half light brown sugar (coconut sugar also works). Hope that helps! I used to not be the biggest fan of carrot cake but lately I have been all about it! I love that you made this version whole wheat :). And that frosting– GENIUS! I was the same way growing up about carrot cake. I feel like it was my sister’s favorite. But I wanted peanut butter pie (because I just HAD to be different). Drooling! Carrot cake is my favorite cake even over chocolate. Cashews make the best frosting. I used it with coconut milk for my vegan carrot cake too! 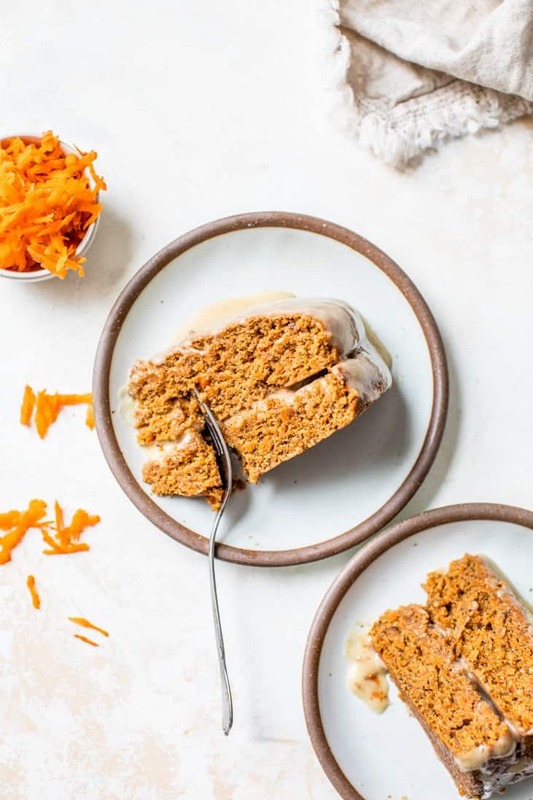 I saw your vegan raw carrot cake and can’t get over how amazing it looks! What a stellar recipe! The texture of this cake is fan freaking tabulous! And it’s vegan! Wow – I’m blown away! So gotta try this! 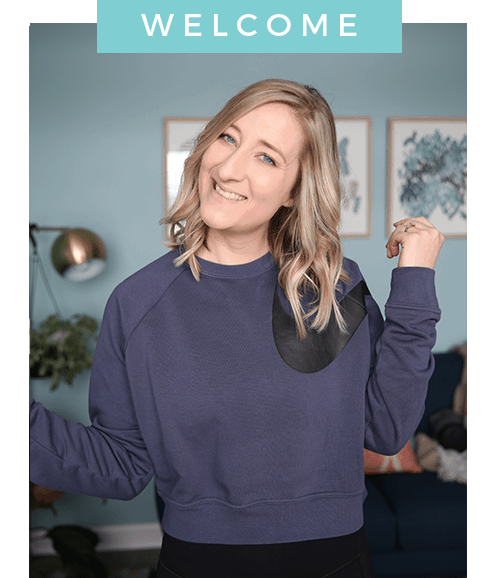 You should be hair flipping all month long after this recipe! Nice use of the wedding centerpieces! Oh my gosh!! YUM!! This looks amazing! What a great recipe! So perfect for Spring and Easter! Thanks for sharing girl! And hmmmm… my fave cake to eat (I’m not a baker) is actually a tart! Hail Merry Miracle Tart from Whole Foods! It’s raw vegan and gluten free and SO good! I’m a chocolate LOVER!! OMG. This looks and sounds incredible! I love those icing ingredients!! Thank you Alexa! It was my first time doing a cashew frosting like this but it is a fun change! Yum yum!! This carrot cake looks incredible! 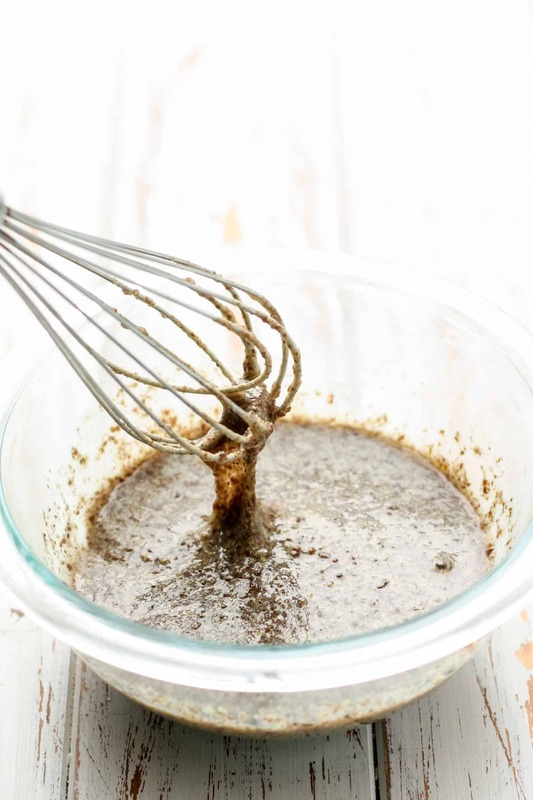 I love the use of applesauce and coconut oiL! This is truely perfect for Easter. And Spring time in general! This. Is. EVERYTHING. (yes caps were necessary there!!!) Girl, all of your baking is amazing. When we have a BGB girls weekend (because that’s totally going to happy one day) I designate you head dessert maker. Carrot Cake is my favorite dessert EVER and I can’t get over how incredible this looks! Pinning! OMG that cashew FROSTING!!!!! I mean, the entire thing looks crazy good, but that frosting makes me want to lick that entire cake clean! Hi Daniela, thanks so much for your comment! I see in the recipe page I actually forgot to put in 3/4 *cup* of water. 🙂 Thank you for bringing that to my attention! So it is 1/4 cup of milled flaxseed mixed with 3/4 cup water, soaked for 10 minutes and it will start to get thick. Hope that helps! Hey Asley! Thanks for the recipe. I am planning to make it tonight! Do you have an idea by how many regular eggs I can sub flax eggs in this recipe? thanks! Man oh man, it would be so freaking challenging to just enjoy ONE slice, but who says that’s even a rule? But in all seriousness, this vegan carrot cake look super freaking delicious! I love how the base is made with applesauce and white whole wheat flour for health and fluffiness. I could totally picture myself baking this for my birthday or my wedding!